“Why You Should Register”, The Arizona Daily Star, 13 April 1913 Sunday Morning, Section 2 Front Page. Transcription by Karen Board Moran. 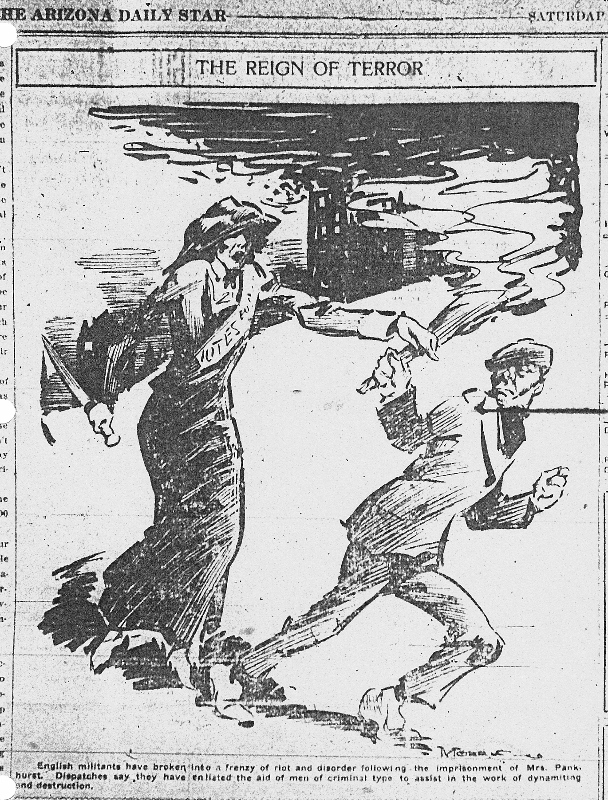 The Arizona Star 12 April 1913 Saturday Morning, p. 4. These are some of the questions that are liable to be asked you any time now if you inquire whether “she” has registered or not. Of course you want to register first yourself; so you can explain how easy and simple it is, and don’t forget to dwell upon the importance of it either. For be it known to you society woman, business woman, home woman, and woman of every walk in life, that the Great Register is now open and ready to receive your name, in order that you many cast your vote at the next election, special, general, emergency, or whatever it is. Over the phone Saturday inquiries were coming in by the dozens concerning this and as it is supposed that most women at least read the society columns (which, if they don’t we’re lost) it is hereby set forth that women may register at any time they choose between now and May 1. May 1, however, the Big Book closes, and if there is a special election and you have not registered, Fair One, you will lose your vote, so it’s up to you to get busy during the next fifteen days. The senators and representative have made an emergency clause for this purpose so you can have something to say at the next election, and now that you have the franchise that you have fought for so hard, don’t fail to take advantage of it. There is nothing the lease bit embarrassing about registering your name in the Great Register in the recorder’s office at the court house, for that is where you must go. There are two young women in that office who will assist you, and this is the time to go, for the men will not register until later, most of them having already registered. The only requirements are that you must have lived in Arizona for at least one year, that you are able to read the constitution of the United States, and that you are over twenty-one years of age. It is not necessary that you say how much over twenty-one you are, in fact, it is understood that you are twenty-one if you go to register. There are no intimate questions; there is nothing in the least troublesome about it in any way. Just because you have never gone to register before is no reason that you should hesitate now. Now is the accepted time, and there are only about two weeks left. There’s no time like the present for registering your name as a voter in the great state of Arizona, and you may miss something if you don’t take advantage of the opportunity. The next item was “COLLEGIATE CLUB HOLDS IMPORTANT MEETING”.